Most Tube Anemones have either 64 or 128 tentacles and they have radial symmetry. The number of tentacles depends on the species but most have only 128 tentacles. The Tube-dwelling Anemones that are smaller and live in colder water are mostly the ones with 64 tentacles. There are stinging cells on the tentacles and the colors of these tentacles can be a range from purple, pink, green, blue, yellow, and brown. This animal also makes a long slime covered tube that it can pull itself into when it feels threatened. This tube can extend about a meter and is buried into the mud. Tube Anemones are usually found on muddy and sandy ocean bottoms in the Puget Sound region of North America and cover a range from Alaska to Baja California. 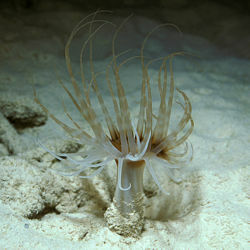 This creature is not an anemone but is really a coral and makes a tube to live in. When threatened, the Tube-dwelling Anemone pulls itself into its tube for protection from predators. This species grows to about 12” and is a favorite food for the Nudibranch.